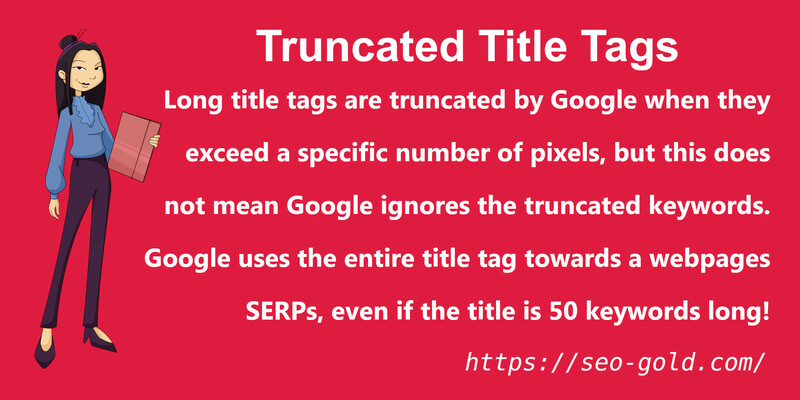 Long title tags are truncated by Google when they exceed a specific number of pixels, but this does not mean Google ignores the truncated keywords. Google uses the entire title tag towards a webpages SERPs, even if the title is 50 keywords long! 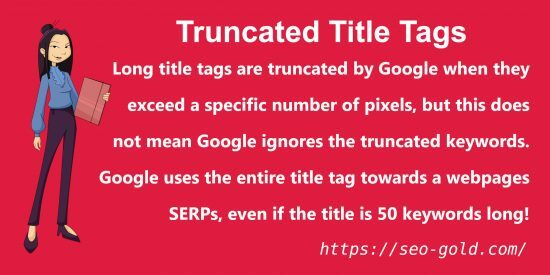 This does not mean because Google WILL index and count long title tags you SHOULD create the perfect title and stuff what in effect will be hidden to Google search engine searches. Google will share the title tag benefit over the entire title tag, if you’ve added 50 keywords to a title, each word will gain 1/50th (2%) of the title tag SEO benefit. If your main phrase for a page is 4 keywords long like “Best Title Tag Length” each of the four keywords will gain 25% of the total title SEO benefit. If the above is the start of a 50 keyword title “Best Title Tag Length… 46 more keywords” each of the important keywords gain only 2% of the title tag SEO benefit!